Milena Kiseleva: In Yakutia bastards rode over the bear. Today the December 28, 2016. A year ago, in December 29, 2015, I published an article entitled "Bastards killed a white bear". In that article, I shared my thoughts about the disgusting act against a white bear at the North Pole. The feeling of what I saw on video that showing the yet another murder of a bear, but this time the brown, about the same. I still do not cease to grieve and be shocked by the callousness of people, who commit such disgusting, unjustified, vile and heinous deeds. For those who do not know about this. In Russia happend another murder of a bear. This time such a nightmare happened in Yakutia. 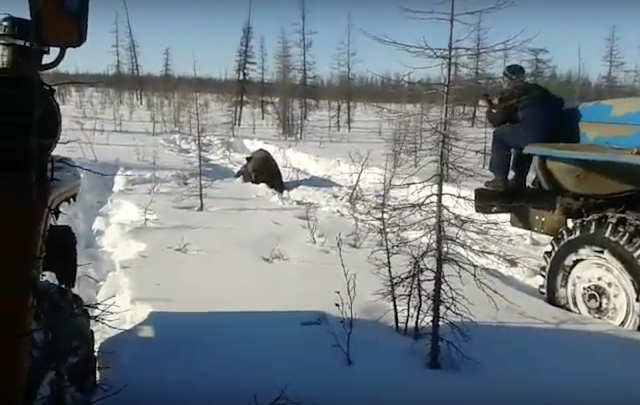 On video clearly seen how the driver of a truck ("Ural" or "KrAZ") headed toward the bear, several times deliberately rode over it, then came the second truck and also began to ride over it.After that one of the killers (all of them are locals, polar workers) tried to pierce a bear with an iron rod. 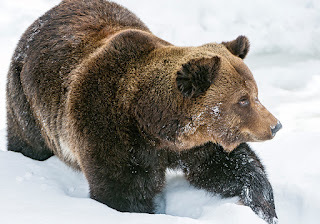 The bear was killed with joyful shouts, just for "fun", and then they justified yourself by the need to kill for the sake of "salvation" of yourself or surrounding. They saw a bear from a distance and while in the salons of big trucks, he could not represent a threat to them. Around the Taiga and people there do not live. All this time, these callous murderers filming this nightmare. I warn you, the video contains scary scenes! P.S. I am still convinced that people is the most terrible living creature on this planet.